Steeped in gold rush history and made strong by a combination of traditional industries and a thriving visitor economy, the Grampians region stretches from the western edge of Melbourne to the South Australian border. The region is characterised by the grandeur of natural assets like the Grampians National Park, and prosperous agricultural and associated sectors that contribute to an enviable lifestyle in its major centres and towns. The Grampians incorporates the Central Highlands and Wimmera Southern Mallee Regions. Sebastopol West Kinder Iris Ramsay Kinder. Ararat, Avoca, Bacchus Marsh, Ballarat, Beaufort, Daylesford, Edenhope, Great Western, Hopetoun, Horsham, Kaniva, Nhill, St Arnaud, Stawell and Warracknabeal. 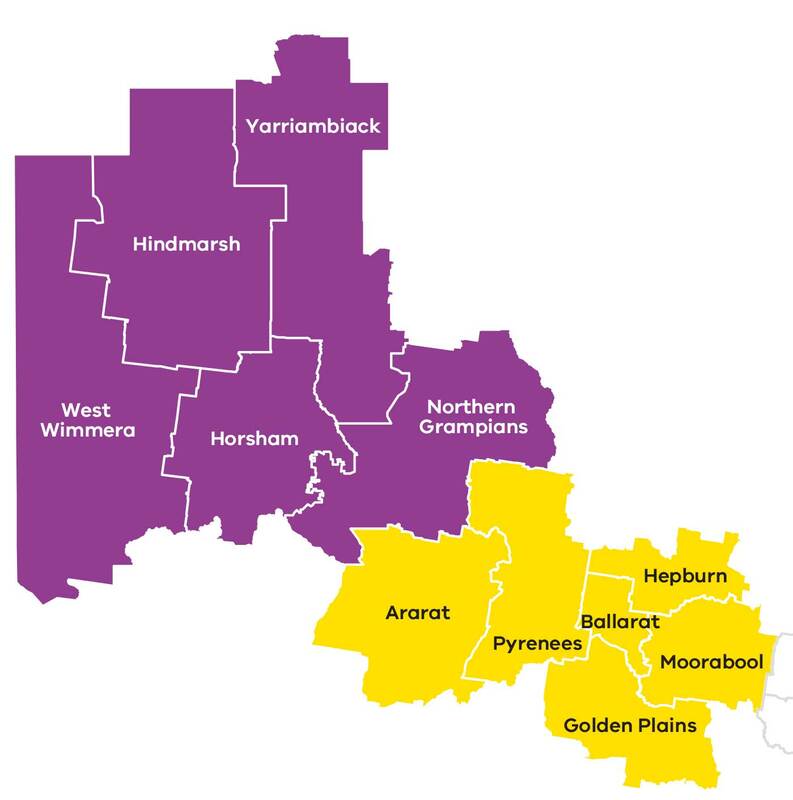 The Grampians has different economic characteristics across the region, from the mineral resources and dryland farming areas in the Wimmera Southern Mallee sub-region, to the Central Highlands sub-region which is driven by the economy of Ballarat and its proximity to Melbourne. The Wimmera Southern Mallee sub-region is focussing on diversifying its economic base through increasing opportunities to value-add within the agribusiness and mining sectors. In the Central Highlands sub-region, Ballarat is growing its services industries including health, education, professional and ICT services. The region also has a significant manufacturing base including companies such as McCains, Masterfoods, Haymes Paints, MaxiTRANS, Hakubaku and AME Systems. Home to Federation University, the Australian Catholic University, SMB, NMIT College of Wine near Ararat, TAFE colleges and multiple options at all levels of schooling the Grampians region has options whatever your education needs. A fantastic range of leisure and sporting facilities exist in the Grampians region including football and cricket grounds, swimming pools, tennis courts, golf courses, racecourses and natural landscapes for bushwalking. Outdoor adventurers are drawn to climbing locations on Mount Arapiles and around the Grampians, while prospecting for gold near Avoca and St Arnaud can prove to be lucrative hobbies. Horsham Regional Art Gallery has an impressive collection of Australian photography and contemporary art. The Ararat Regional Gallery hosts a dynamic textile collection while the Ballarat Fine Art Gallery is home to a stunning collection of Australian colonial, goldfields and contemporary art. The Museum of Australian Democracy Eureka, on the site of the Eureka Stockade, is Australia’s newest museum dedicated to democracy. The Eureka Flag, is on loan from the Ballarat Fine Art Gallery, is the centrepiece of the museum’s exhibitions. A number of smaller community and commercial galleries can be found throughout the region. The Grampians hosts a range of festivals including the iconic Stawell Gift, the Horsham Awakenings Festival, Nati Fringe Festival, Grampians Grape Escape food and wine festival, Daylesford Chill Out, Clunes Back to Booktown, Ballarat Heritage Weekend, Grampians Wildflower Festival, the Ararat Jailhouse Rock Festival, the Grampians Jazz Festival, the Ballarat Beer Festival and the Ballarat Royal South Street competitions. Strong growth in demand for high quality food products in Asia presents an opportunity for the region in agriculture and food product manufacturing, as well as supply chain industries such as freight and logistics. New opportunities may emerge in renewable energy, mineral sands mining and tourism. The completion of the Wimmera Mallee Pipeline offers opportunities for intensive animal industries, horticultural and agricultural expansion. The large dry-land farming parts of the region are highly exposed to changing weather and climate patterns. Towns and communities around Ballarat and along the Melbourne to Ballarat corridor, as well as towns in the Grampians National Park and adjacent to the St Arnaud Ranges National Park are also exposed to the increased risk of bushfires. Changes to structure of industry, in particular manufacturing, will present challenges for the broader economy and the region’s workforce. The RDV information portal has more detailed data and statistics on the Grampians Region and regional Victoria more broadly.